In this, our first ‘real’ podcast, we discuss whether genre effects your writing, what was the worst and best writing advice we ever received and when is it time to walk away. We also give a writing update. Our pilot episode is now up on iTunes. Please listen, subscribe and if you’re feeling happy, please review… if it didn’t make you happy, just close it and walk away! This is the inaugural episode of the Irish Writers Podcast, where three unpublished writers discuss their writing, their journey towards publication and interesting topics for writers. In this episode Kate, Cathy and Maire introduce themselves and their writing. And to James Scott Bell’s book ‘Write your novel from the middle” which I read, not wrote, clearly. 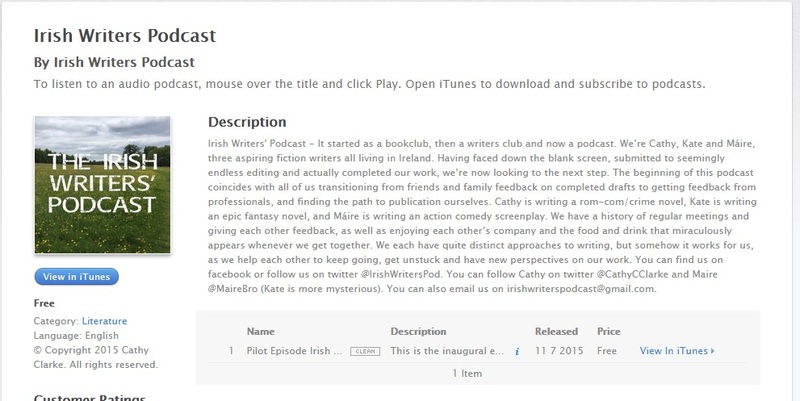 Pilot Episode Irish Writers Podcast | Irish Writers Podcast.